Recent updates to FileMaker make this technique largly unnecessary but it was quite popular back in the day. You may run into it in solutions that may have been created with earlier versions of FileMaker. In this example, we are showing you how a relationship can attempt to read your mind. 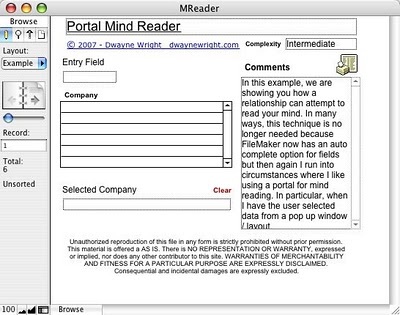 In many ways, this technique is no longer needed because FileMaker now has an auto complete option for fields but then again I run into circumstances where I like using a portal for mind reading. In particular, when I have the user selected data from a pop up window / layout. So this technique is a little long in the tooth but I think you may find it interesting none the less. In the Entry field, type in the letter A and the portal will refresh to return possible matches. Continue typing the other letters of the alphabet until you get to the letter F, pausing a couple seconds after each letter ( A, AB, ABC, ABCD, ABCDE and ABCDF). You will see the list of possible choices change in the portal. When you see the selection you want, then you click the Pick Me button in the portal. NOTE: If you have records in which the company name may be blank, you will want to use the first six characters of the contact name instead. NOTE: You may want to add a “Create New Contact “ button in case the record does not appear in the list. This script would want to exit you out of the script loop we cover above. This sets the company field to the related value in the picked portal and halts all scripts, including the looping one used in the reader. This could come in handy in some situations where you are doing data entry. This look ahead feature may help reduce the number of data entry mistakes and reduce the amount of time needed to accurately enter in a record.